I had a question yesterday from Shelley about how I took this shot. I’ve been meaning to tell you that I recently got a remote control for my camera. I had a remote for my SLR camera years ago and it came in so handy. Previously I had used the timer on my camera to take shots that I was in, like this or this. I found this to be a bit tricky because you need to have something in the frame to focus on. This is difficult, if you’re by yourself and shooting against a white wall. The other thing you can do is position yourself within arm’s reach of the camera. Also pretty limiting. I got the remote about a month ago and you may have noticed that I’m changing up locations for my clothing photo shoots. In this photo, I used a tripod in my backyard. But very soon, you’ll see shots of me in High Park, on the West Toronto Rail Path, who knows where! Most of the time, I just find a bench, table, tree stump or other suitable object to put my camera on. Once in a while, I actually take my tripod along. At any rate, I’m getting much better natural lighting, more interesting shots and having way more fun creating these photographs. The great thing about the remote is that there are two settings. The first setting has the camera taking a photo as soon as you press the button. This is great if you are trying to reduce shake on your camera, rather than pushing the camera’s button. (especially in low light situations) The second setting has a timer, giving you time to hide the remote and position yourself within the frame. With the remote, you can focus the camera from a far distance. The remote came with a handy little pocket that slides onto my camera strap. The pocket is black and rather ugly, so you may be seeing a customized and cute remote pocket very soon! teehee john has one and he still needs to work on how to press the button without pointing it directly at the camera. can’t wait to see more pics taken with your remote! I’d love to have a remote for my camera! I’ve only got a point-and-shoot right now, but hope to one day soon have the money for a DSLR. Amazing! I actually meant to ask on Sunday how you were taking these photos and how to use the timer on our camera. 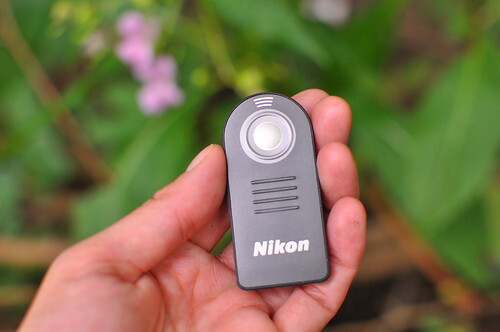 Is it just a standard Nikon remote, or is it a special model? melissa – the remote is so much fun. i can see you and john having a lot of fun with it! jennifer – i definitely recommend it when you get a dslr for sure. katherine – i’ll show you how to use the timer the next time you drop by. it’s easy. the remote is called ‘Nikon ML-L3 Remote Control’, it works with the d90 and some of the other nikon models. you can pretty much get it anywhere, henry’s, vistek or aden camera. it’s only $30. fun!